We all know the problem about not having the files you need on you iPad, phone or other device. 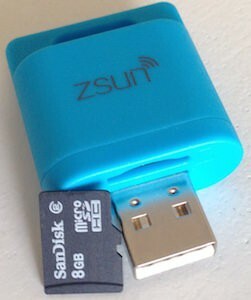 Now the people from ZSUN have you covered they made a little USB stick that can hold a Micro SD card and just plug it into a USB charger and you have you own WIFI hotspot that also works as bridge. And you can also use it as a simple flash drive by plugging it into a computer. It’s really handy as there are IOS and Android apps so just plug it in a power source and connect to the wifi network and then in the app you can rout to a “normal” wifi connection. This is really nice as now you could use this at places where you wifi is only good for one or two devices as some hotels offer. The IOS and Android apps make it possible to browse files, watch movie look at pictures all stored on the flash drive. And this fun little ZSUN device comes in a bunch of colors so that it can match your life. 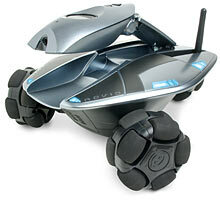 Come and take a closer look at this ZSUN WIFI Bridge And Card Reader. For different people home means something different but for a true geek home is where the wifi connects automatically because there they can game, read, surf and what ever else they do online. 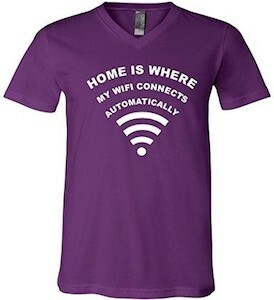 This t-shirt shows the typical wifi symbol but the last lines are text and you guessed it they say “Home is where my wifi connects automatically”. And this wifi t-shirt comes in many styles colors and sizes so that any geek can get a shirt with these graphics on it and maybe when you wear them people start giving you their wifi password so that you can have more homes. Tell the world where your home is by wearing this Home Is Where My Wifi Connects Automatically T-Shirt. Remember our post about the T-Shirt with WiFi Detection? Sure you do and you love that shirt I just know you do, but sometimes it gets cold outside and you can’t wear it 🙁 No worries we found a solution for that. Now you can have your own Cap that Detects WiFi just like the T-Shirt did it will show you the strength by bars on your Cap. Of course it will not tell you that you can use this network but at least you know where you could find some WiFi when you need it. The WiFi Detection Baseball Cap will find WiFi 802.11 b/g and that makes it a great tool to find some friends that need Wireless internet like people with iPhones or netbooks. Go check out this awesome WiFi detector Baseball Cap .